Every year at Christmas I get lots of joy from taking the tiny 3 to see Santa. I love seeing the look of excitement on their faces and the utter delight they get from meeting him and being given a present by him before Christmas day. However I always despair at the cost of the visit and the quality of the gift. In the past I have paid quite highly for my budget and the children have received a pound shop toy, whilst there is nothing wrong with pound shop toys if I’ve paid a lot for a Santa visit that includes a gift I would like it to be of an almost equal quality to the money I have paid. I also try to avoid the Santa’s at big shopping centres as they seem to be very expensive, rushed and usually with large queues to boot. 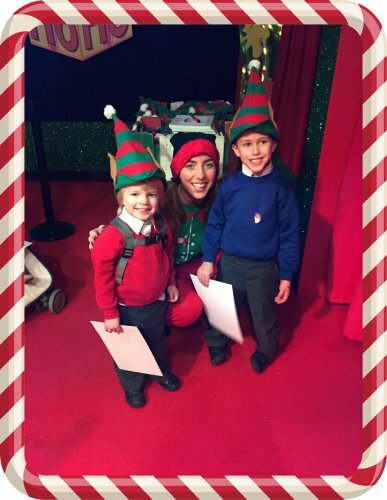 That said when I was invited by Intu Merry Hill to try out their new christmas attraction Elf School I was a little bit sceptical as to how good it would be. I am however pleased to report that I was pleasantly surprised. 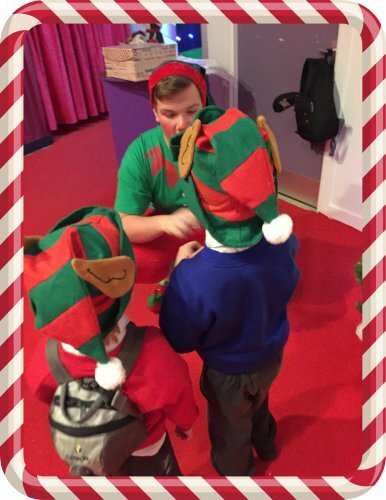 Elf school was brilliant, and at a cost of £6 per child it was fantastic value for money as it was more of an experience than just a Santa visit, an experience that starts before you even pay. Outside the Elf School is a wonderful mechanical puppet attraction that starts with a magical touch from the children. You then get guided a small group at a time through into Elf School. 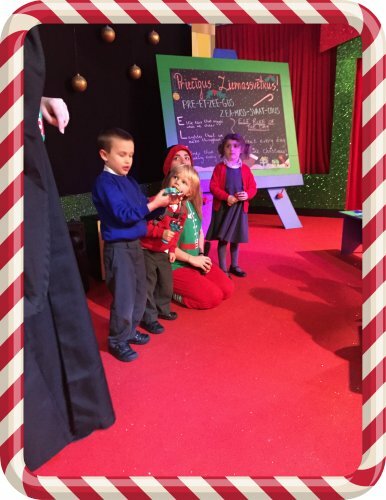 Here the children learn Christmas songs and about what it takes to become one of Santa’s elves, and get sprinkled with elf glitter. It makes waiting to see Santa a lot more bearable for the children. The boys were really excited to be picked to play the bells and lead the singing at the front. You then wait for your visit with the main man himself Santa. As they limit the amount of people in each elf school time slot there really isn’t that long to wait to see Santa, however if you have eager pants in their pants little ones like me Intu Merry hill have something to keep them entertained. 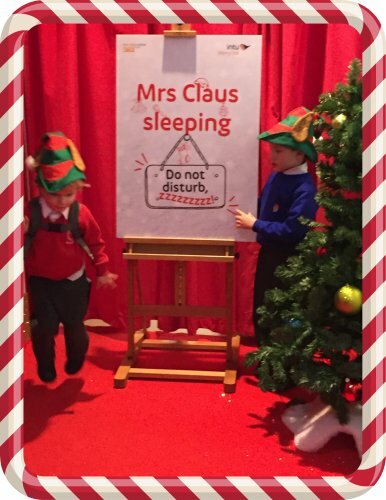 They have little quiz questions about Santa and his reindeer dotted around as well as amusing signs. This sign in particular had TP jumping for joy! Once you get into see Santa you are not rushed, and Santa seems to have all the time in the world to talk to the children. He is also very friendly and doesn’t promise anything that the children ask for but tells them he will see what he can do. 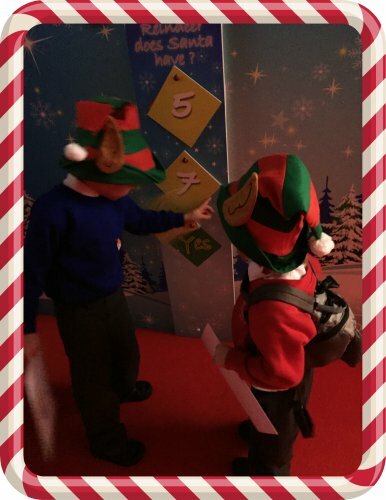 Once the children have finished talking to Santa a friendly elf will take their photo with Santa which you can purchase at the end of the experience and also a golden ticket that they can exchange for a gift in Santa’s toyshop. I was worried that Santa not giving a wrapped gift would take a bit of the magic away from the experience, but I couldn’t have been more wrong. The boys thought it was brilliant to be able to choose their own gifts and I was impressed at the wide array of gifts to choose from. JR chose a Barbie colouring set, TP chose a Ben 10 colouring set and LA chose a hungry caterpillar place mat colouring book. There were a range of non-colouring toys too including a dinosaur craft toy and a sew your own doll’s house. 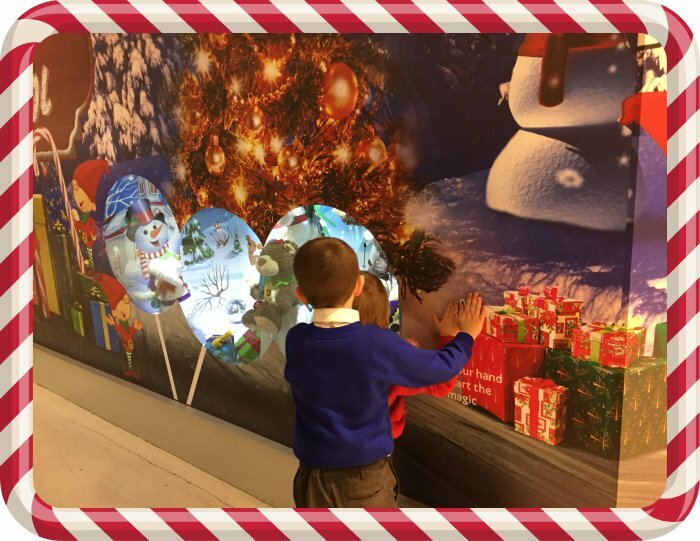 After choosing their gifts the children are given some magic elf dust to help show Santa where to go on Christmas eve and then jump in the coloured splashes all the way out of the grotto. All the elves were super friendly, and even have their own twitter account. Disclosure: We were given a free visit to Elf School for the purposes of this review, all words, opinions and photos are my own. This entry was posted in Days Out, Review, The Tiny Three.